A member of the Killer B's when playing for the Houston Astros, Craig Biggio is now a member of a much more exclusive "club," the National Baseball Hall of Fame. This beautiful Northern White Ash bat is a full-size commemorative bat honoring the Hall of Fame career of Craig Biggio. Fans and collectors alike will jump at the opportunity to add this authentic Louisville Slugger Bat to their home or office for proud display. Each bat is laser engraved with the Hall of Fame logo and the long list of career stats amassed by Biggio throughout his playing days. Order yours today. 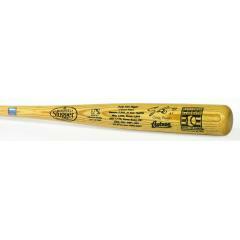 Craig Biggio Hall of Fame Induction Commemorative Bat $129.95 Sold Out!